Welcome back to The Honey Cottage! This month was super exciting; we got some amazing pictures of the hive, and our bee suits are almost complete. Lily has been bugging us for weeks asking where her bee suit is and when will she be able to look in the hive. 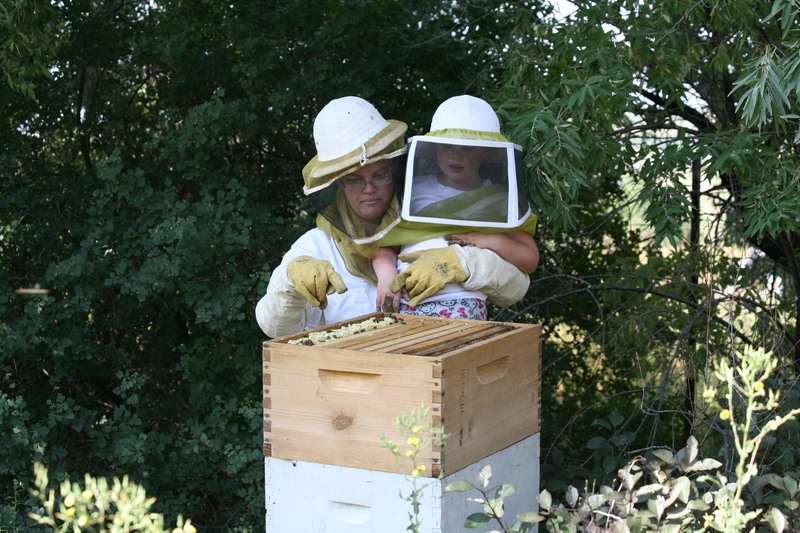 I used to be afraid that something would happen with my little one if she got near the hive. However, the more education and experience I get with the bees makes me realize how safe she really is. So my gold nugget that I would like to share is; when we give ourselves and children more knowledge, the less fear there will be. Knowledge = power. As you can see from the picture Lily only has a hood on and is looking into the hive. She was not afraid of the bees at all and I relaxed a lot! I just remembered to keep talking to her and that kept us both calm. One of the best ways to save our bees is to stop fearing them. They won’t bother you if you don’t bother them. Bees are looking for food and have no intention on attacking unless they feel threatened. It has been an pleasure learning about these ladies and how they work. So proud of Lily for wanting to be the next generation of beekeepers. Stay tuned and learn what we are up to!